Asus used its Mobile World Congress press conference to unveil its long awaited Padfone, a 3 in 1 hybrid smartphone device, which plugs into a larger tablet- and has the option of being docked into a keyboard base station. The handset is a 4.3-inch Super AMOLED device, powered by a Qualcomm Snapdragon 1.5GHz processor. It's a large, solidly built unit with a textured back that keeps design consistent with its big-brother the Transformer Prime. It's extremely sturdy in the hand, but if you like your phones small, this isn't going to be the handset for you. As you'd expect, the540x960 AMOLED screen looks great, which makes it ideal for movie lovers, and gamers- but with those needs served so widely elsewhere the Padfone needs another reason to buy; that reason comes in the form of its seamless transformation into a tablet PC. The Asus Padfone comes with a 10.1 inch tablet chassis, which resembles that of the Asus Transformer Pad; previously known as the EeePad Transformer. On its own the tablet is as dead as a doornail, but pull back the hatch on the back, and slide the 4.3-inch Padfone inside, and it springs to life in seconds as a full Ice Cream Sandwich tablet. When the Padfone is docked, we'd challenge anyone to know that this 10.1-inch device is powered by a smartphone crudely showed into the back. The 1280 x 800 screen looks crisp and clear, and Ice Cream Sandwich works smoothly. We watched video content and viewed pictures, and the smartphone behind this big-screen device didn't flinch or dither. In tablet mode the Padfone lacked the snappiness of the Transformer Prime and its quad-core engine, but it was still highly usable, and as good as any Android tablet out there. The whole Padfone idea would immediately fall to pieces if the transformation from phone to tablet wasn't completely seamless, but in the display units we tested, everything worked smoothly. We docked the device in various states of use, including video playback, and the tablet sprang to life without a glitch each time, which was great to see. Asus has a history of pulling some dubious stunts in their press conferences, and we thought we'd got away lightly, until the Padfone's stylus came out to play. When in tablet configuration, the stylus doubles as a handset, so you can speak to people without having to either remove the phone from the back, or hold the whole tablet up to your face. The result makes you look no less of a burke, but social misgivings aside, the stylus itself is a nice piece of kit. It's comfortable to use, we were able to draw and write accurately using the Padfone's built in apps, but we challenge anyone to do that in Starbucks, and leave with their head held high. 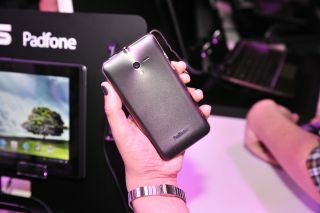 The Asus Padfone will be released in April, so check back for a full review.